The Kabbalah (also Cabala, Kabala, Kaballah, Qaballah, etc.) is a mystical Jewish tradition that teaches that the elect of God shall know both Him and the universe and will be raised above common knowledge to a spiritual level where they will understand the secrets of Holy Writ and creation through symbolic interpretation. Kabbalists affirm that the elect shall discover in the ancient texts whatever they choose, and they have the right to assert that the things they discover had been in the sacred scriptures from the beginning. Letters and numbers, the Kabbalah teaches, are not merely signs invented by humans to record things, events, and thoughts, but are in themselves reservoirs of divine power. Hebrew, in the Kabbalistic sense, is a universal language, capable of restoring to humankind the universal understanding that existed before the confusion of tongues at the Tower of Babel. It is interesting to note that the Greek school of neo-Pythagorean philosophers also understood numbers and letters to be divine things endowed with supernatural powers. at a time. The Maaseh Bereshit (Hebrew for "work of creation") dealt with the divine utterances that brought the universe into being and how control of these sounds or letters would grant great magical powers over the material substance of the world. Maaseh Merkavah (Hebrew for "work of the chariot") attempted to utilize the mystical practices of heavenly ascent achieved by Ezekial in his vision of the fiery chariot and the throne of glory in heaven. After a period of intense preparation, including fasting, meditation, chanting, and the recitation of certain letter combinations and the names of angels, the adept of Maaseh Merkavah sought to attain a vision of the divine throne of God and to become transformed from human to angel. Combined with the Maaseh Merkavah and the Maaseh Bereshit to form the Bible of the Kabbalists was the Zohar (Hebrew for "splendor"), which was ascribed to the followers of Simeon Bar Yochai, who was said to have recorded the mystical teachings of Elijah during the years the prophet spent hiding in a cave. Moses De Leon who claimed to possess a copy of the ancient manuscript, published The Zohar in the thirteenth century. After De Leon's death, however, his wife admitted that he had attributed his own writings to Simeon Bar Yochai in order to assure sales to those interested in such ancient magical texts. Modern scholars concede that while the Zohar splendidly depicts the spiritual reality that lies behind everyday experience in the material world, there are many passages that betray the influence of Spanish culture of the thirteenth century and were likely written at that time by De Leon. The influence of the Kabbalah on mystical Judaism, as well the European alchemists, scholars, and philosophers of the Middle Ages, was powerful and all pervasive, and the text remained a source of strength and inspiration to seekers of enlightenment for many centuries. 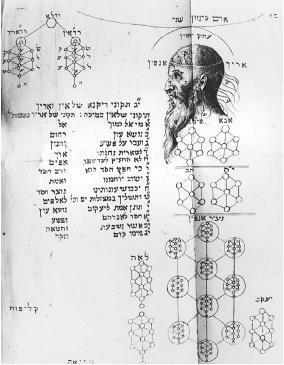 As the influence of the Christian Church grew stronger throughout all of Europe, the Kabbalah and those who taught its mysteries retreated into the shadows of universities and libraries; and for many scholars, the text was regarded as one of the esoteric and sometimes forbidden hidden works of ancient wisdom. In the twentieth century, Carl G. Jung (1875–1961) introduced the Kabbalah to the psychotherapeutic community and spoke highly of its value in achieving a sense of wholeness with the universe. Study of the Kabbalah underwent a dramatic rebirth of interest in the 1960s when there was both a resurgence of Jewish spirituality and an interest in the mystic teachings of the Kabbalah by many individuals in the New Age Movement. The appeal of the Kabbalistic teachings to those seekers in the New Age lay to a great extent in the understanding that God's essence may emanate through various realms of existence and that each human may draw from that supreme power to help bring the act of creation to its final perfect state. Many Kabbalistic groups sprang up around the country utilizing the ancient teachings to assist their members to achieve deeper states of meditation, to accomplish healings of themselves and others, and to reach higher levels of mystical insight. Berg, Yehuda. The Power of Kabbalah. San Diego, Calif.: Jodere Group, 2002. Kaplan, Aryeh. Meditation and Kabbalah. New York: Weiser, 1989. Scholem, Gershom. Kabbalah. New York: Penguin Group, 1978. Spence, Lewis. Encyclopedia of Occultism. New Hyde Park, N.Y.: University Books, 1960. Unterman, Alan. Dictionary of Jewish Lore and Legend. New York: Thams and Hudson, 1991.